This is the first book on linear algebra written specifically for social scientists. It deals only with those aspects of the subject applicable in the social sciences and provides a thorough understanding of linear algebra for those who wish to use it as a tool in the design, execution, and interpretation of research. Linear mathematical models play an important role in all of the social sciences. This book provides a step-by-step introduction to those parts of linear algebra which are useful in such model building. It illustrates some of the applications of linear analysis and helps the reader learn how to convert his formulation of a social science problem into algebraic terms. 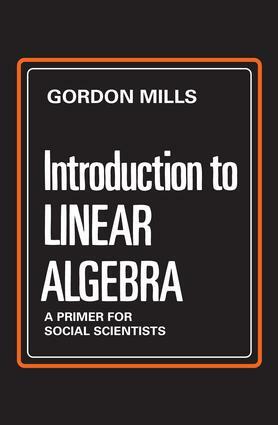 The author covers matrix algebra, computational methods, linear models involving discrete variables, and clear, complete explanations of necessary mathematical concepts. Prior knowledge of calculus is not required since no use is made of calculus or of complex numbers. A novel feature of the mathematical content of the book is the treatment of models expressed in terms of variables which must be whole numbers (integers). The book is distinguished by a step-by-step exposition that allows the reader to grasp quickly and fully the principles of linear algebra. All of the examples used to illustrate the text are drawn from the social sciences, enabling the reader to relate the subject to concrete problems in his field. Exercises are included as a necessary part of the text to develop points not covered in the text and to provide practice in the algebraic formulation of applied problems. An appendix gives solutions (or hints) for selected exercises.